Warning: This dish is not healthy. And addicting! I look forward to it EVERY thanksgiving as my mother-in-law makes it. She taught me to use cheez-whiz…which is so yummy. I try to forget about being too healthy on days on like Thanksgiving! 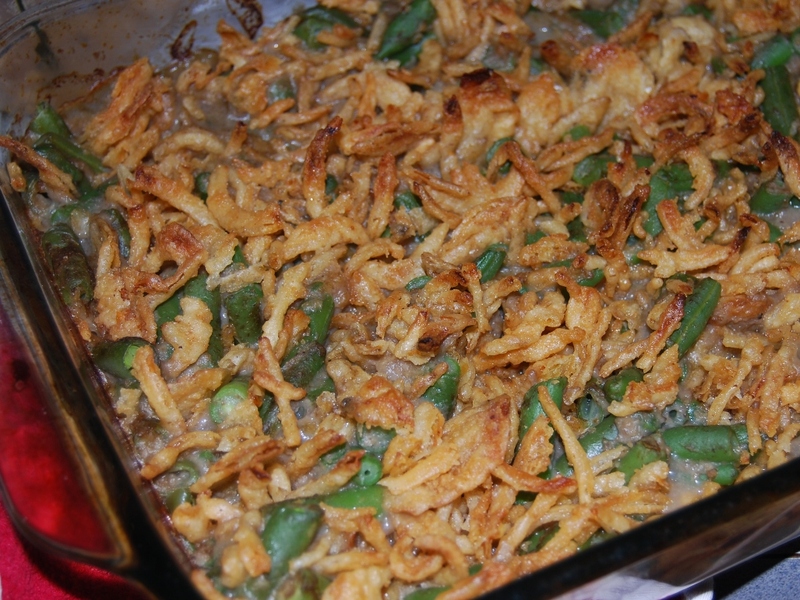 MIX all ingredients except 1/2 can onions in 1-1/2-quartcasserole. BAKE at 350°F for 30 minutes. Topwith remaining 1/2 can onions. Bake 5 minutes. Garnishwith slivered red onion, if desired. TO Make Ahead: Prepare as directed except for baking; cover. Refrigerate overnight. When ready to serve, bake, uncovered, at 350°F for 45 to 50 minutes or until thoroughly heated, toppingwith remaining onions during last 5 minutes of cooking time.